I've always been a big fan of Director Kathryn Bigelow. Her career has expanded to about 20 plus years. Although her style has changed over time, she has only made a handful of films. This woman directs in clumps with Blue Steel (the picture I am reviewing) being part of the Point Break/Strange Days/Near Dark era (roughly 1985-1995). Now, in present day, she's making solid war movies like Zero Dark Thirty, The Hurt Locker, and K19: The Widowmaker. There's always a radical mix of unbearable tension and a visceral violent nature that seems to accompany most of her work. And that's never been more evident than with Blue Steel, a glossy crime thriller that hit theaters with a thud back in 1989. This exercise is effective in how it's about, not what's it's about. Bigelow's direction is confident and she stages gunfights and shoot outs with total aplomb (I get a kick out of the way she loves to film close ups of 44 magnums being loaded bullet by bullet). Seeing that this film came out a couple of years before Point Break, you can definitely tell the similarities. However, where Point Break got away with its premise based on pure luck, Blue Steel starts out solid and capable, only to dissipate into bogged down action scenes that are predictably tired. What's worse, the villain in this flick is laughable and hammy (oink! oink!) to the point where you have to tell him that's it's only a movie and he should not try so darn hard. 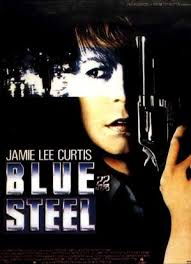 There's also the fact that "Steel" feels like a total vanity project for star Jamie Lee Curtis (I honestly don't think this was intentional). What happens in the 102 minute running time is purported on reminding us, the audience, that's she’s a female cop. I say so what, what's wrong with a woman being a police officer? Anyway, there are definitely a few things that drive me batty about Blue Steel (I also found it rather strange that Oliver Stone was credited as a producer). One of them is the half baked script. Its got a few juicy lines here and there, but the whole thing feels like a hack job. The other is the fact that we, as the audience, are supposed to fear a puny Wall Street broker (the late actor Ron Silver) who hears voices in his head and looks like someone who got picked on in school when he was much younger. As the antagonist, he failed miserably. The only problem was that the casting director thought otherwise. So okay, here's the gist of Blue Steel. It's about Megan Turner (Jamie Lee Curtis), a rookie in the NYPD who within a day on the job, guns down a ruthless lowlife (Tom Sizemore in his first role. Later on, he became a regular in Bigelow's next couple of films) who is trying to rob a supermarket. When she shoots and kills the robber, he drops his revolver and it is picked up by one of the civilians lying on the ground (Ron Silver as Eugene Hunt). 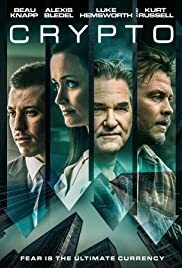 Eugene Hunt, a New York Stock broker, gets off the floor, takes the gun, escapes from the crime scene, and goes on his own criminal, killing spree offing several random people (everyone from a call girl to a friendly, elderly man just walking down the street). Turner's objective upon hearing of this situation is to find out who stole the gun (she doesn't know initially) and arrest this person before more people lose their lives. This is all done with the help of Nick Mann (played by Clancy Brown who for a change, gets to play one of the good guys), a fellow homicide cop who is assigned to the case. Ultimately, you don't get a clear idea of why this Hunt person becomes a psychopath. And the minute he's out there, the movie kind of flies off the handles. With Blue Steel, there are far too many unanswered questions and they seem to present themselves when they rear their ugly head about an hour in. For instance, I don't get why Silver's character would go after Curtis at the end even though he has let her live throughout the proceedings and shot and/or killed everybody else. Then there is the awkward love scene (about 20 minutes before the closing credits) between Turner (Curtis) and interim partner Mann (Brown) while Hunt is on the loose (it seemed like they came off more as brother and sister, not romantic interests). And what's the deal with the opening sequence in which Curtis is being tested in the field for cop duty. She fails miserably but cut to the next scene or two, and there she is graduating from the police academy with flying colors (I guess we have to assume that she eventually passed). Finally, we get our fearless leader (Turner) being promoted to detective after a serious suspension from her job as just an arresting officer (the film gives us a reason but it feels filtered into the script in order to move the plot along). Yes, overall the nature of events in "Steel" started to get silly. I was no longer absorbing what was on screen. Basically I just made up my mind that nothing could save this mess. But I pressed on, hoping the ending could somehow make things more palatable (you know make the film better than it really is, sometimes I'm right, this was not the case here.). There was a bright spot however amidst the muck. Look for Richard Jenkins in an interesting supporting role as Hunt's criminal defense attorney. He gives lawyers a bad name and then some. Blue Steel's flaws are visible throughout (especially toward the last quarter). But you could still see even back in 89', that Kathryn Bigelow was bound for insurmountable success. She's now an A list Director with lots of talent to burn. In the end, what we have with "Steel," is a vehicle with a great look/feel reminiscent of Tony Scott’s (True Romance) meets Walter Hill’s (48 Hours), a solid opening hour, and an effective sense of style for action/suspense (very small doses of substance though, except during the flashback cuts which are well done). The story however, is the culprit. And the script, well it caters to the most simplistic of moviegoers. So to end this review, I'll say this: See Blue Steel for Bigelow's shooting style and nothing more cause if you tell yourself that this is a worthy cinematic entry, your mind will be far from a "steel" trap.